Part of the programme is a site visit to the Deepwater Container Terminal Gdansk (DCT Gdansk). This site visit is included in the registration fee. DCT Gdansk is Poland’s largest and fastest growing container facility, and the only deep-water terminal in the Baltic Sea Region having direct ocean vessel calls from the Far East. Located in the heart of the Baltic in the Port of Gdansk. 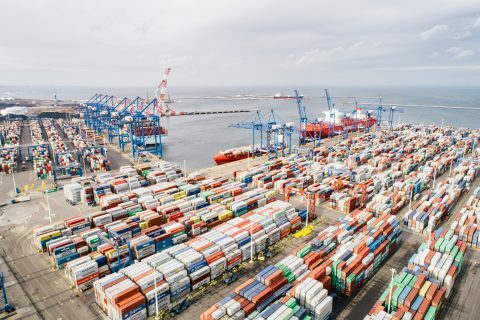 The Deepwater Container Terminal Gdansk connects Poland to the largest shipping trade-lane between Europe and Asia, ensuring that Polish goods can be traded with China more efficiently in terms of costs, delivery times and a lower carbon footprint per container than alternative ports. The terminal handles import and export, transshipment and transit. With an easy nautical accessibility comprising of 17.0m deep approach channel and up to 17m depth along the berth, year-round ice-free access combined with operational excellence, DCT is a natural gateway for all CEE containerized trade volumes. Thanks to infrastructure investments of the Polish Government and the City of Gdansk, DCT terminal is well linked with the international hinterland which ensures its ideal position as a true Central European and Russian Gateway. DCT Gdańsk is one of the most efficient ways to serve the Baltic Sea market via transshipment and also the most cost competitive way to serve the hinterland markets of the Czech Republic, Slovakia, Belarus and Western Ukraine. In 2018 DCT Gdansk handled 1.9 million TEUs, with direct calls by the largest ships afloat. DCT Gdansk is the only terminal on the Baltic Sea capable of handling ships of this size. DCT Gdansk can boast an impressive track-record of continuous development in terminal infrastructure and modern handling equipment. It is also actively involved in various environmental and local community protection activities, being the foundations for sustainable socio-economic development.